This genus is represented across the continent, but the Western species Mystacides alafimbriata is probably the most prominent. Black Dancers emerge by crawling out onto rocks or other protruding objects, so emergence is not terribly important. The females dive to lay their eggs on the bottom. Shelter Type: Long, thin cases made of various debris. The case may be three times as long as the actual insect. 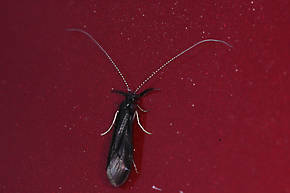 Male Mystacides sepulchralis (Black Dancer) Caddisfly Adult View 10 PicturesThis was one of many of its species which were gathered in small, low-flying swarms of about a dozen insects near the alder trees in the afternoon on a small stream. 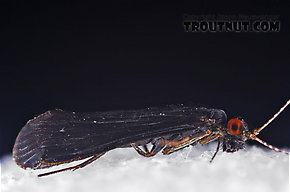 I've been extremely frustrated several times by trout feeding on Black Dancers, especially on the Brule in Wisconsin. The flies gather in little swarms beneath overhanging alders along the bank, usually within a foot or two of the surface, and "dance" around. A trout or two, usually small, will appear below them and rise steadily. This is one of the most reliable insect activities on that river in the summer. It's quite unlike any other hatch, since it never affects most of the stream. Instead, there are just little pockets of activity here and there along the bank. It would be interesting to see if some of the trout are Mystacides "specialists" who are conditioned to cruise the banks looking for this food source. At any rate, I've never had much luck catching these trout. I've tried most often on the Brule but I've run across similar situations on Finger Lakes and Catskill rivers in New York, too. Has anyone cracked the code?